Moundsville Penitentiary, closed as a prison in 1995, is now a popular tourist destination. 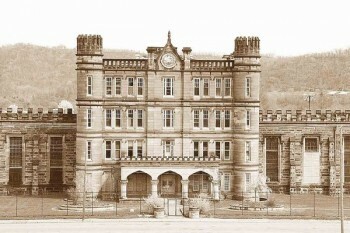 MOUNDSVILLE, W.Va. — West Virginia became a state on June 20, 1863, and construction on the Moundsville Penitentiary began in 1866, with inmates providing much of the labor. The prison was closed by court order on March 27, 1995, after it was determined by the court that the inmate cells were too small and living conditions were inhumane. The facility was replaced by the Mt. Olive Correctional Complex in Fayette County at a cost of $85 million dollars. The old Moundsville penitentiary opens for the season on April 1 for day tours and paranormal events. Day tours include a historical tour of the facility with an informative guide describing daily life behind the “walls” of the former West Virginia Penitentiary. “We welcome over 25,000 day tour guests each year plus numerous school groups from West Virginia, Pennsylvania and Ohio,” said Suzanne Park, executive director, Moundsville Economic Development Council, West Virginia Penitentiary Tours. “Visitors are fascinated by our facility. At first glance it looks like a castle or a gothic fortress. Once inside, they can browse the archives in the museum or look over the many artifacts we have collected. Pictures of the facility through time, including a working farm, coal mine, textile facility, theatre where inmates performed plays, music and entertainment for the public. We have crafts made by inmates and even an invitation to a public hanging,” Park said. Parks said visitors are surprised the facility still has the actual electric chair “Old Sparky” used to carry out the death sentence for nine inmates. “They are also astounded when they see the beautiful artwork on the walls, in the cells and in common areas throughout the facility because it was all created by inmates. They are also shocked to know that inmates were housed in the facility as recent as 20 years ago. The cells are very small and employees worked under extremely difficult conditions – trying to manage hundreds, sometimes thousands of inmates and knowing that at any moment you could be in a situation where their life was in danger,” Park said. “Our haunted house attraction grows each year with the addition of new themes, additional areas to tour and last year we added Zombie Paintball,” Park said. “Over 1,500 people come to the former prison each year to participate in one of our paranormal events – either exploring the halls and basement areas of the facility all night, or during one of our many 3-hour evenings,” she said. Tours are available from Tuesday through Sunday, 11 a.m.-4 p.m., closed Mondays and holidays. Tickets are available for purchase in the gift shop; groups of 20 or more (schools, charters, families, churches) should call 304-845-6200. The prison at Joliet provided the prototype for the West Virginia Penitentiary. It was an imposing stone structure fashioned in the castellated Gothic architectural style, adorned with turrets and battlements, like a castle. West Virginia’s facility is about half the size of Joliet. The executions by hanging were held in the northern area of the West Virginia penitentiary. The first execution took place in 1899 when the state assumed responsibility of capital punishment from the counties. Hangings continued until 1949, with a total of 85 men executed by this means. From 1951 to 1959 nine men were electrocuted in the chair known as “Old Sparky.” West Virginia abolished capital punishment in 1965. The prison at one time was on the U.S. Department of Justice’s Top Ten list of most violent correctional facilities in the nation. Two movies produced at the prison were “The Night of the Hunter” in 1955 and “Fools Parade” in 1971. Most recently parts of “Out of the Furnace” with Christian Bale, Casey Affleck, Zoe Saldana and Woody Harrelson was filmed at the penitentiary. By statute, the state was responsible for the facility. However, in 1998 the Moundsville Economic Development Council obtained a 25-year lease for the property. This nonprofit organization uses funds from the activities that take at the facility to maintain and work toward refurbishment. Records indicate the prison population rose to more than 1,000 several times in the 1960s. When the prison closed in March of 1995 there were 675 inmates incarcerated there. Mock riot draws hundreds of police to W.Va.